There's a spiritualness associated with the term 'retreat'. It implies a direction, a movement, physical and mental away from the outside world; an attempt to rediscover one's self, one's inner core and ultimately one's being. It's not therefore a word instantly related to cycling. When Moor Retreats got in touch with Simpson about a luxury road cycling retreat in Devon our thoughts divided into two camps. One saw the opportunity as a testosterone fuelled few days pitting ourselves against wannabe KoM addicts - the other went the way of chants, joss sticks and the purification of mind and body. After a brief chat with Ross Lovell, the man behind the idea, we were put at ease: we totally got what he was trying to achieve. The essence of his plan was similar in part to the passion and drive that unlied our publication. Ross has a dream - he wants to share the beauty of the roads and scenery he regularly rides in Devon with other cyclists. Indirectly he wants to promote the West as a new uncharted cycling destination and maybe shift the focus away from the much lauded North of England. Undiscovered roads and a chance to ride them with a local, ticks all the right boxes. It encapsulates a certain element of beauty found in cycling. The topography of Devon is perfect for solid base miles with the added reward of breath taking scenery. If this wasn't incentive enough Ross had applied additional icing on the cake by putting together a 'luxury' package including a three-night stay in a country house, five star catering, a first rate 'goodie bag' and the option to ride a top of the range bike courtesy of Factor bikes. 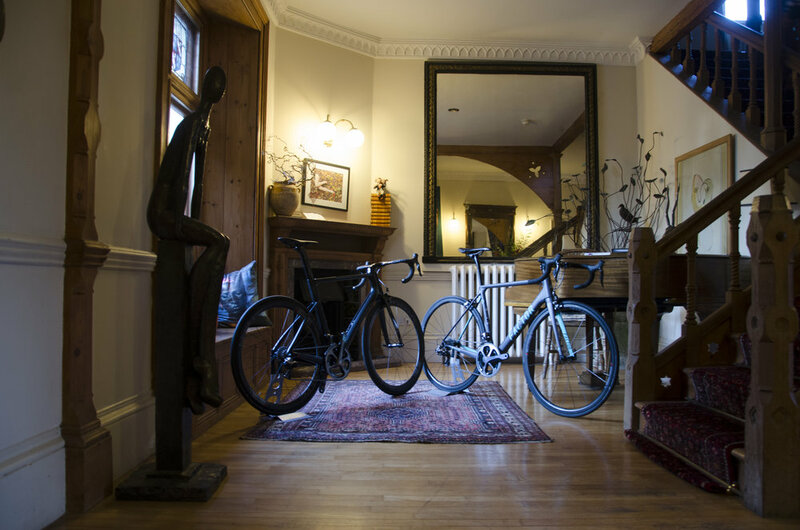 The evening meal at The Old Rectory was a gathering of complete strangers united by a love of cycling. As the introductions began it felt very 'Agatha Christie' like, maybe we would be one short for breakfast the next morning? Before dinner we gathered in the rear courtyard and got to meet our bike for the weekend, with the exception of two guests, everyone had opted to sample a Factor bike. In a lot of ways it felt like we were treated to dessert before the main course. At Simpson we love experiencing new and different bikes. It challenges perceptions, broadens the mind and offers a chance to sample new products. We all fall victim to complacency, sticking to what we know isn't a bad thing but needs challenging from time to time. The prospect of riding Di2 gears, Black Inc carbon wheels and a Prologo saddle rendered the bad weather forecast secondary in conversation. 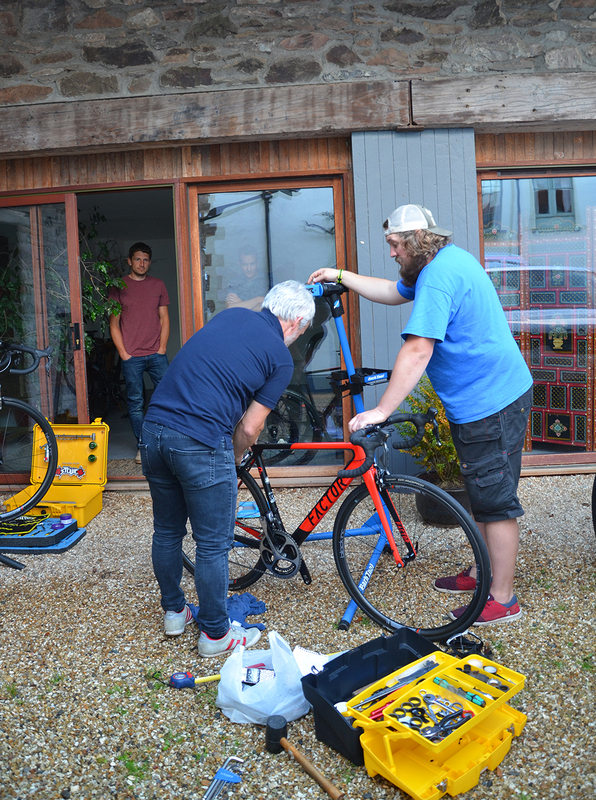 Moor Retreats had a qualified mechanic on hand to both set up and fine tune everyone's bikes along with a back up/support vehicle carrying a variety of essentials including individual riders spare kit to lovingly prepared lunch boxes. It also doubled up as a broom wagon as, when or if required. After dinner the next days route over Dartmoor was discussed - 75 miles of undulation finishing on a 20% gradient. Fuelled on an array of wholesome food (and wine) everyone was settled yet keen to experience some of Devon's hidden gems and undiscovered roads. All of us would have encountered at some time or other the unexpectedness of the weather. It was still officially classified as summer as we set out on Saturday morning eager for adventure. An hour or so into the ride we experienced the wrath of the gods as wind and rain joined forces to test our mettle and our reserves. What should have been a total cycling feast now turned in an extremely testing set of riding conditions. As much as the allure of Dartmoor beckoned, ride leader Ross made the difficult call to cut short the first day's route. Ultimately the ride experience should be remembered as a pleasurable one and not an endurance event. It was a tough call but a well measured one. We still encountered some of the stunning scenery promised to us as well as many of the fiendish gradients that cut short any ongoing conversations. Day one's ride had transformed the strangers of the previous evening into riding buddies. After a well earnt massage and an evening meal fuelled with the tales of that day's riding, we heard about the 55 mile route that lay in store for us the following morning. Maybe the reaction was a bitter sweet one. We now knew what to expect and what potentially the weather could inflict. Luckily where we were staying had the added bonus of a boiler room - the perfect antidote for soaking wet cycling shoes. No wants to begin a ride with damp shoes! Sunday morning at 7.30 saw everyone back together for a pre-breakfast, pre-ride yoga session. The extremes of the previous days riding conditions had forced us all into some unnaturally tensed shapes on the bike. The massage had helped greatly but we all needed some restored suppleness for ride ahead. A breakfast of yoghurt, cereal, homemade porridge and an endless supply of locally baked organic toast set us up for another day's potential battle with the elements. Having had a pleasant, mainly downhill ride until lunch, it was only then that the weather decided to adopt the torments of Shakespeare's King Lear for it's influence. As we crested the climb onto Exmoor all scenic views were obliterated by sheet rain driven by a constant cross wind. Our only companions were the sheep and ponies native to the area. As the riding conditions worsened we found ourselves not really caring. A strange statement to make but one fuelled by the ever increasing feeling of predictable, safe and sure-footedness of the bikes we were riding. I found myself singing Lennon's immortal line 'No-one told me there would be days like these...' as the wind drove the rain straight into my face. The Factor O2 felt better the more it was ridden, it elevated the spirit in all of us and by doing so definitely played a major part in the total enjoyment of the weekend. The retreat had introduced us all to new possibilities. Things we'd thought about but never got a chance to try out. 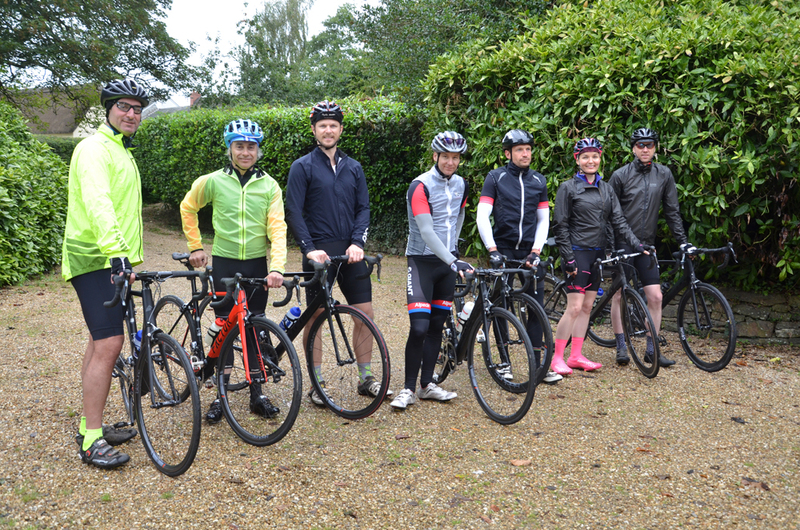 Equipment, diet, post-ride procedures and most importantly riding other people's favourite routes. We experienced a lot and made some new friends - chapeau to Andy, Paul, Victoria, Matt, Alan, Russell and of course Ross. We also salute Frank, our mechanic for the weekend. No-one had any mechanical issues and our bikes were immaculately prepared and ready to ride every morning. Even with the conclusion of La Vuelta being played out on TV our own ride experience triumphed over everything. 'Retreating' in Devon was an amazing experience and we would definitely recommend it to all our readers but, as a word of warning, go prepared for any extreme mother nature can conjure up. Thank you Ross for extending the retreat's hospitality to accommodate both my wife and our 16 month old son. 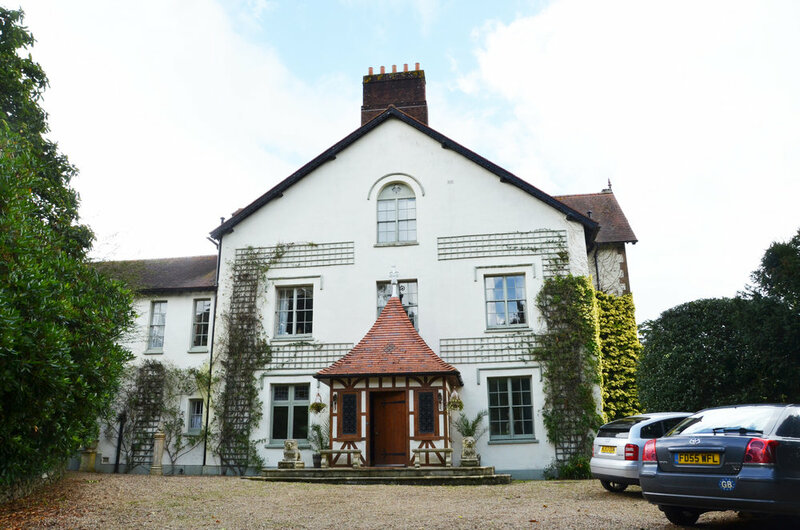 The retreat encompassed all our needs and left us feeling energised.